Any true “seafoodie” is all about experiencing exceptional seafood and wine pairings. There are few things better than a delicious, flaky and buttery piece of fish or shellfish paired with a freshly corked bottle of fine wine. But, let’s be honest, most of us aren’t chefs or sommeliers. So we’re taking the guesswork out of the equation and offering up five perfect seafood and wine pairings! 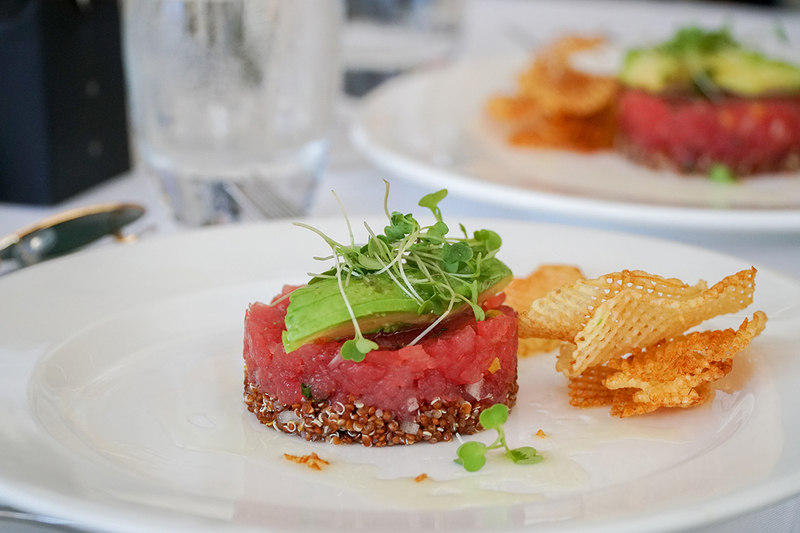 We reached out to a few of our favorite restaurants and top chefs from South Beach Seafood Week, a seafood and wine festival in Miami, to get opinions on great seafood wines and their perfect dishes. In the end, it was almost impossible to choose our favorites! Take a look at our unique seafood wine pairing guide; we know you’ll love it! Stiltsville Fish Bar is one of those unique Miami experiences you can’t miss. Drawing locals in for quality seafood and Key West inspired drinks, the restaurant is centered around the glistening view of the harbor and stunning sunsets. What makes this pairing so delicious is the mix of the kataifi wrapped local shrimp, roasted coconut and key lime flavors with the prominent oakiness of the Chardonnay. 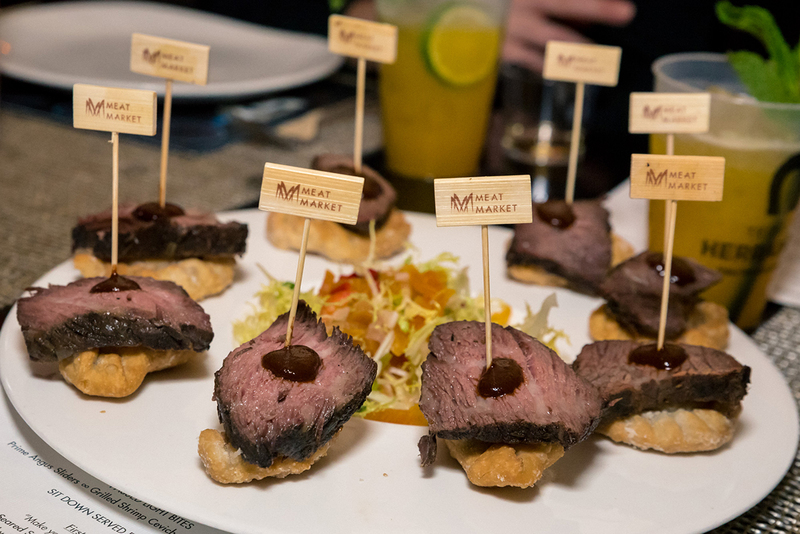 They balance each other out so that the full-bodied wine enhances every bite of the perfectly crispy and refreshing dish. If shrimp isn’t your favorite, try Stiltsvilles’s Surf n’ Turf Burger or Soft Shell Crabs! If you want to eat, drink, and be a local, then you have to try the wine and seafood at Papa’s Raw Bar. It’s a South Florida staple, in Lighthouse Pointe, known for the freshest catches that arrive every morning. Paired with an over-the-top wine list that will leave you stumbling to choose your favorite, there’s really no way to go wrong when eating here. That’s not to say that you can’t make your Papa’s Raw Bar experience second to none with the ideal seafood and wine pairings, but where do you start? If you’ve never had Hogfish, you’re missing out. 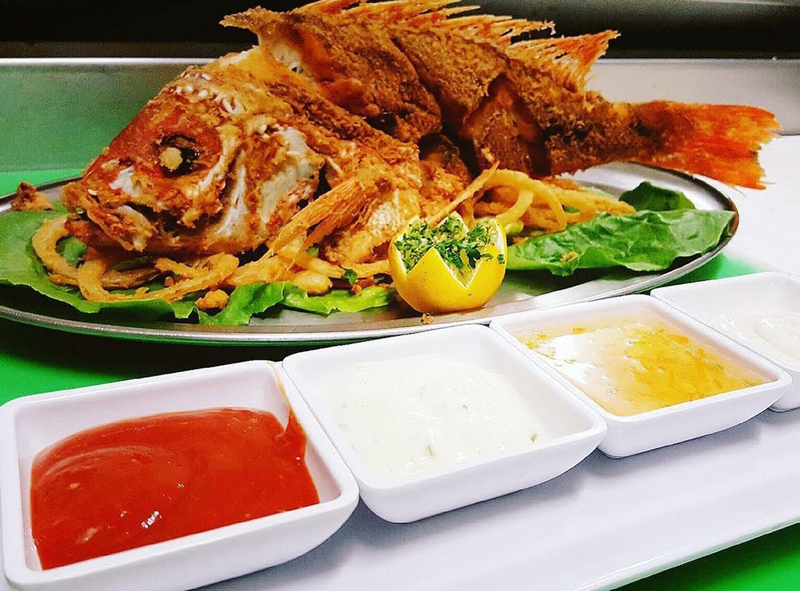 This flaky fish offers the most delicate and succulent bite in Lighthouse Pointe, and is amazing all on its own. But when paired with a fruity Chardonnay from William Hill, it’s an explosion of flavor. The highly acidic wine enhances all the sweetness of the Hogfish and every bite is like a tropical paradise. And if you decide to try something besides the Hogfish, might we also recommend the Coconut Cracked Lobster Belgian Waffle (coconut fried lobster bites on a Belgian waffle with Key Lime sauce). Known for its steak, the Meat Market Executive Chef Sean Brasel is also a master of knowing what kind of wine goes with seafood. At his contemporary restaurant, he offers cutting-edge culinary creations that you’ll immediately fall in love with and find nowhere else. Daring enough to pair red wine and seafood, Chef Brasel loves the idea of a herbaceous and light Pinot Noir paired with a flavor-filled empanada. It’s an ideal pairing that will give you everything you could want in a meal. 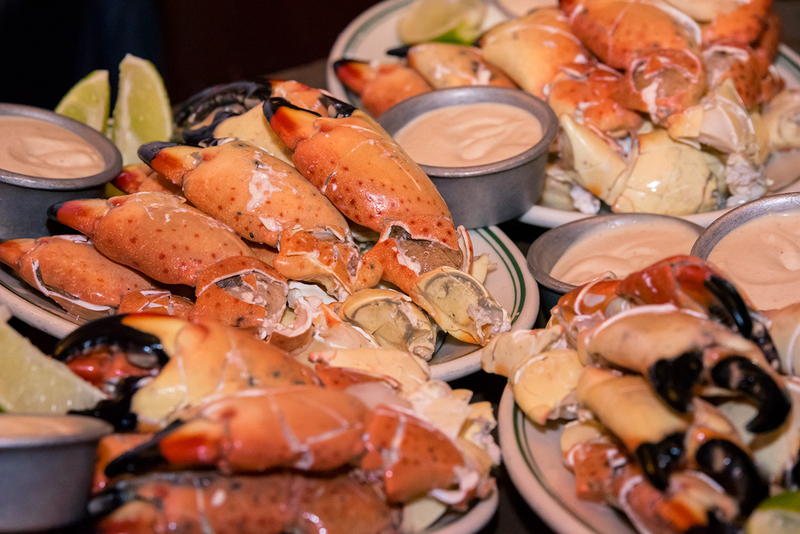 Known as the place to go in Miami Beach, Joe’s Stone Crab South Beach is such an iconic restaurant paired with a fantastic menu. You could literally point blindly to any dish and walk away with something amazing. It’s why the who’s who of Miami have visited Joe’s over and over again for over 100 years. Nowadays, they’re known for their incredible Chef Andre Bienvenu who makes mouthwatering dishes you’ll be talking about for weeks. Of course, there’s nothing more iconic at Joe’s than their stone crab claws, which is why Chef Bienvenu chose them as part of his favorite seafood and wine pairing. Stone crab claws are sweet, so the medium-bodied Talbott Pinot Noir is the perfect choice for the dish. With notes of roses and fruits, the wine’s lusciousness enhances every succulent piece of crab meat in every way. A seafood, steak, and crab house, Truluck’s has it all. 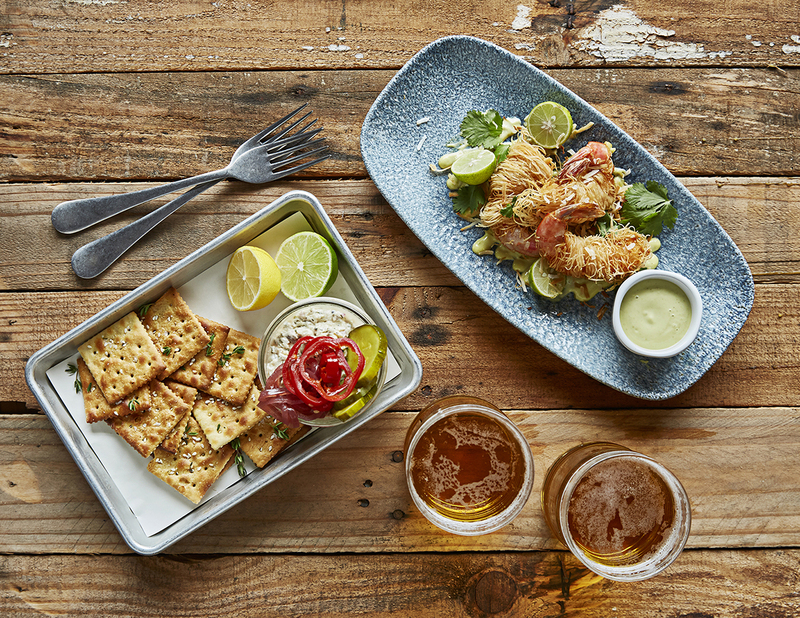 Over the bridge from Miami Beach, in the heart of Downtown Miami, their fresh catch seafood menu is a getaway for the senses that’s hard to beat. The seafood and wine pairings are one of the major things we love about this restaurant. With their massive wine list, there’s something for everyone here. Who doesn’t love pan-seared scallops, and when paired with a Talbott Chardonnay, the flavors are almost magical. The sweet and delicate scallops aren’t overwhelmed by the buttery, full-bodied Chardonnay. Instead, the wine brings out the subtle flavors of the dish until every bite is a lesson in deliciousness. And if scallops aren’t for you, then try ordering the Pacific Swordfish Steak instead. You can find similar food and wine at the SoBe Seafood Festival in Miami this October so make sure you plan accordingly and come ready to eat, drink, and have a blast. 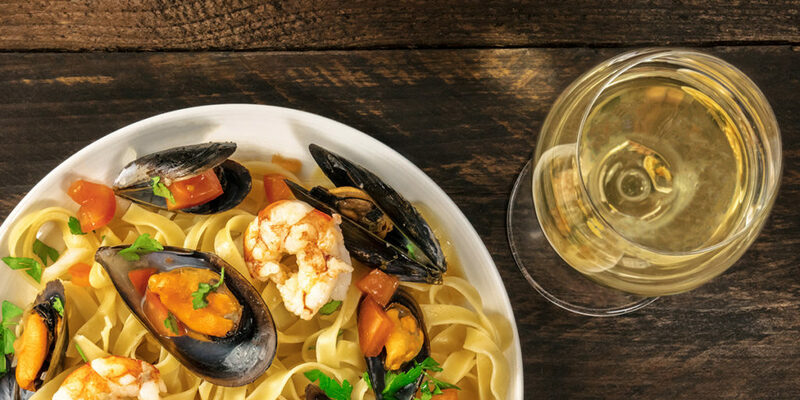 What are your favorite seafood and wine pairings? Sign Up To Receive The Latest.